To the south of Cairns is the highest freestanding natural pyramid in the world. You could be forgiven for thinking it is a tree covered man-made pyramid – the shape is almost perfect. But no, this is a natural phenomenon that is one of the most distinctive landmarks for the small sugar-farming town of Gordonvale. The vegetation on the mountain is heavy, consisting mainly of Australian scrub. Rocks feature heavily, so if it is raining you’ll need to be careful not to slip. Take plenty of water with you and make sure to apply sunscreen regularly. The scenery from the top of the pyramid is spectacular and takes in 360-degree views – it makes the climb worth all the effort. Every year in August, a “Pyramid Race” takes place where hundreds of competitors run up the hill and back again. This is reserved for masochistically fit people who like pain, but if you think you might like to give it a go there is $5000 up for grabs. It has been argued that the most difficult part of hiking Walsh’s Pyramid is reaching the bottom of the mountain by car. It’s not that the road is in poor condition; it’s just that it’s difficult to find. Here are some directions to help. Please be aware the base of the mountain is private property. Park your car in a discreet location that doesn’t block the dirt road used by the cane farmer. From Cairns, drive south past the small town of Gordonvale. This takes just under 25 minutes. 800 metres south of the Mulgrave River on the Bruce Highway you’ll see a small road on the right called Moss Rd. Follow this road for approximately 100 meters, and you’ll find a narrow gravel track heading right. This is marked by a red rectangle. 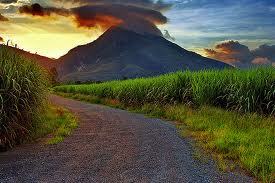 Continue along this track, which borders a cane field, for approximately 100 metres. Soon you’ll be at the parking area, and the path begins at this point.